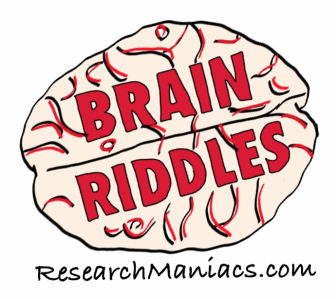 Can your brain handle these Riddles? Click on the Answer below the riddle to see if you figured out the correct answer. What cattle follow you where ever you go? What country has a lot of germs? What country is really cold? What day do potatoes hate? What did one earthquake say to the other earthquake? Between me and you, something smells. What did one sheep say to another sheep after he told a joke? What did the almond say to the peanut when they were about to jump into a bowl of ice cream? You know we are nuts right?! "You're too young to smoke." What did the bone say to the other bone? I see a little crack. What did the chicken say to James Bond when he crossed the road? Hi, my name's Ken, ChickKen. What's yours? What did the chick's mom say when she heard that her daughter won the contest? You did an EGGcellent job!! What did the circle say when Poly left? What did the coffin say to the other coffin? What did the girl melon say when the boy melon when he proposed? What did the left hand say to the right hand? How does it feel to always be right? What did the light bulb think when he was carried by a baby? What did the ocean say to the boy? What did the ranch say to the refrigerator? Close the door I'm dressing! What did the tornado say to the wind? Don't I have a mighty fine spin! What did the volcano can to the other volcano? What do get if you cross an elephant with a fish? What do get when cross a cow and a duck? What do some men have they don't want, but would not part it for a million dollars? What do space cows say? They can all be flipped and still be the same. What do trees and teeth have in common? What do you call a country, where all the cars in it are pink? I have no eye deer. What do you call a fairy that hasn't taken a bath? What do you call a flying skunk! Normal You have fingers on both hands! What do you call a mouse in a suit of armor? What do you call a pan spinning through space? What do you call a very intelligent squirrel? What do you call a wizard in space? What do you call old french fries? What do you comb a rabbit with? What do you get if you cross fire with an employee? What do you get if you pour hot water down a bunny hole?